The Airbus A380 will be delivered to Singapore Airlines in less than two weeks and will make its first commercial flight in a little more than three weeks from now (25OCT2007) with the scheduled services following only 3 days later. What will be awaiting the first passengers onboard? And what will be waiting for other passengers flying on the same plane but with a different airline, or as a private jet? We are trying to give you an idea! First of all the facts: The A380 has approximately 633 square meter (sq m) of cabin area, the upper deck has 300 sq m and the main deck has 333 sq m. Airbus claims the typical configuration would mean 555-seats with three cabin classes (in this arrangement a peson in first class would have 6 times as much cabin space as a person sitting in economy). But the maximum can go up to around 800 passengers in a full economy, low-cost airline type of seating arrangement, and of course the minimum can be one passenger if the aircraft is used as a private jet – there was at least one such order placed as Airlineworld has reported earlier. Singapore Airlines’ A380s will be configured with a first class cabin consisting of 12 “Singapore Airlines Suites,” at the front of the main deck, 60 business class seats on the upper deck and 399 economy seats spread across both decks. So the aircraft will seat 471 in total. (You can find the seatmap here.) It will be replacing one of three 747-400s on the Singapore-Sydney route, which seats a total of “only” 375, so the increase is almost one hundred passengers. SIA said the business and economy cabin products are modeled on those launched in late 2006 on the 777-300ER. The new Singapore Airlines Suites, which will be unveiled at the delivery of the A380 on Oct. 15, “will feature the ultimate inflight luxury, in a class beyond First,” according to the carrier. Emirates President Tim Clark is promising a spectacular interior for its A380s but is tight-lipped on details, although he was happy to confirm that EK wants to double its commitment to the type. Emirates has recently unveiled the airline’s newest ultra-long-range product aboard a 777-300ER over the stunning skyline of Dubai, but he would only say, “You haven’t seen anything yet” compared to the 777 interior. He said the A380 interior will be revealed in the second quarter of 2008. Emirates (EK) is reconfiguring its entire 777 fleet with the new look at a cost of $14 million per aircraft, installing the latest version of its Panasonic ICE inflight entertainment system, which now boasts more than 2,000 video, music and game options. The airline is installing first class suites with doors that give total privacy. The suites feature decor and fittings styled on the Orient Express train. Business class gets lie-flat beds while economy seats feature more legroom and larger ICE screens. Something similar can be expected for the A380, but probably with a more luxury… 🙂 There are no indications about how many seats Emirates is planning to place in their A380’s, but it will either be around Singapore’s 470 or below, as we can assume they will add more first class and business seats, which take more floorspace. I can also imagine they would add more social areas such as bars, or even a gym (as Virgin Atlantic is expected to do so). Qantas also says it will offer a new first class product aboard the A380, where the seat will have a built-in massage system, and a sheepskin mattress for sleeping. They also say that first class passengers will be availalbe to invite a guest over for dinner in privacy! The massage seats will also be available in Business Class, together with a lounge and a bar, while the economy seats will be the widest across the whole Qantas fleet. And top of all these luxury aboard the A380 while flying, airlines like Lufthansa are also planning new services even on the ground for first class passengers flying with the largest airplane ever, as Airlineworld has reported earlier. These were only highlights from plans about the interior of the new A380, looking at only four airlines, but until this day 15 airlines have ordered the aircraft, so there will be at least 15 different interiors to choose from. We are really looking forward to the first one to be unveiled in about two weeks: Singapore Airlines! 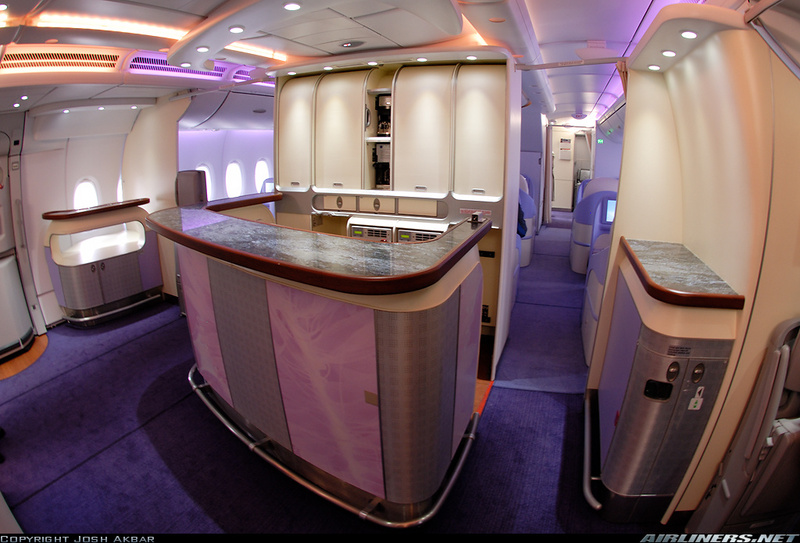 Here you will found more A380 design Interiors, designed and made by Quore Design. Thanks for the hint, your site (http://www.quoredesign.com/) is really-really nice, I myself especially loved the navigation method! And as I saw from the pictures you have designed the A380 interior for the aircraft which was used in the Lufthansa Proving Flights earlier this year (to Hong Kong, New York JFK, and Washington-Dulles)? I have also seen Sichuan Airlines among your clients, which was a very positive experience for me a few years ago – a small, relatively unknown, but world class airline with beautiful interior on brand new Airbus aircraft! Thanks for the comment and for reading our blog! Airbus said US FAA and EASA have approved reduced training for pilots transitioning from the A320 family, A330 or A340 to the A380. The manufacturer said an A320 family pilot now can be qualified to fly the A380 in 13 working days and an A330/A340 pilot in 12 working days. A pilot with no Airbus fly-by-wire experience requires 24 working days to complete the A380 standard type rating course. But after all, the airlines will just cramp them up with a bunch of economy class seats and people will travel the World like sardines in a tin can. Like the blog, good luck! im as MIAT(MALAYSIAN INSTITUTE of AVIATION TECHNOLOGY) student…..
Rafael’s site is really all-around fantastic; I also loved the navigation method! We are in the final stages of construction of a full-scale mock-up of the concept, which consists of half of the top section of an A380’s cabin; it will be displayed soon in Mexico City. I’m very interested to know your opinion about the concept. I think it’s a brand-new, breakthrough idea that you are working on. It sounds like a very good and promising solution for airlines to get more revenue and carry more passengers in the same plane in a more comfortable way, great innovative thinking!! – What would happen if there are not enough passengers at check-in willing to take the upper seats (as I see they will have to climb some vertical stairs to get up there)? – How will they serve drinks to the upper seats during the flight – will the flight attendants climb a few stairs with the hot tea, or will they ask the passengers to bend down (and first unbuckle the seatbelts)? – Would you have a minimum height for flight attendants on duty in such flights (so they can check the seatbelts before take-off and landing for example)? This is especially important as to not allow the people on the upper level to fall out in case of a bumpy ride or bumpy take-off/landing. – How will everyone see the safety demo’s part when they show the nearest exit? – Where can I put my business traveller style carry-on suitcase that I wish to not check-in? – The horizontal separators seem very thin and airy looking – will you have enough space in it to have the oxygen masks plus oxygen pipes to feed those above every seat? – How will you identify these seats? (instead of a rownumber and seat alphabet you need two additional identifiers: floors and levels within the floors) – will the check-in systems be ready to handle such a seating arrangement? Keep in touch, and please inform us when you launch your website! This airline have very beautifull interrior and also fantastic bridge.I like very much this airline.Its a very fastest and very big airline in the world. My brother loves this airplane i don’t know why! Me too !!! I like it ,its new !!! I like this airplane.. A380.. I like it.. I hope, i can flying from jakarta to london using A380 Singapore Airlines.. I would love to see one 380 with all economy seats. That would ready reduce the burden from flights! It’s really great to see a cabin as great and comfy as the photo shows above. And every thing that got a cabin should really be comfy than anything else first.